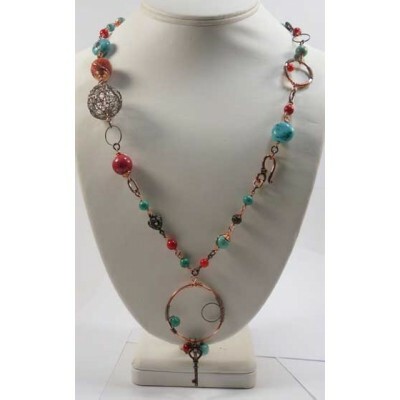 'Arizona Necklace' - features a mixture of metals - copper, bronze and enamel over copper as well as turquoise, faux turquoise, coral and sponge coral. The project involves various wirework techniques. The kit includes written instructions and there is also a downloadable PDF file available with purchase (password required).You can download the file here www.beadaddict.com/kit50/ (password required; supplied with purchase). Please note: You will need to source a couple of small circular containers or pens or pieces of wood doweling to make the frames for the metal circles. I used an old photographic film canister (30mm) (remember those?) and a thick marker pen (17mm) to make the necklace shown - you can choose to make your circles any size you want. You can use any round object you like - e.g., broom handle, pritt stick, expired batteries, whatever you can find!